It is easy to have an idea that is “black and white.” Concepts are easily digestible when there are rules to abide by. This is especially true given the mortal danger that is inherent in mountain sports. Rules often represent security to us thereby allowing us to relax a bit and enjoy the dance of climbing. These rules however, are concrete and we are not likely to rearrange or adapt them with changing contexts. Principles, however, can be sorted in different ways and allow us some flexibility when the environment throws us a curve ball. I tend to recommend a PRINCIPLE-based approach to climbing instead of one dominated by RULES. There is a good reason why we learn anchoring fundamentals with acronyms such as NERDSS or ERNEST. They are systems of principles that should be met, and not a formula or prescribed method for the perfect anchor in all situations. The real world is not a laboratory, and no two environments are congruent. If you are only climbing single pitch routes using a sling shot top rope system, you will likely use a well built anchor on two bolts, trees ,or multiple well placed traditional protection pieces with two opposite and opposed locking carabiners at a masterpoint. It is then going to feel very weird when we go climbing together on a long multi-pitch route, and I tell you that we are going to shorten up our rope, walk together in this exposed 4th class terrain, and my hand and body posture are going to keep us attached to the mountain. What changed? Arguably, it would seem that there are greater risks at foot here, so why not implement a more robust system like we do when we go top roping at the local crag or pitch it out as we have for the last 1,000ft? Are you with a trained and/or certified guide? 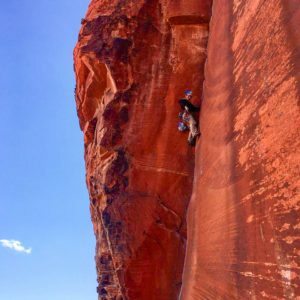 This is a tool common among guides in this scenario and is not one usually learned or practiced by someone who mainly climbs recreationally. I may trust someone who has at least taken a course a bit more, but one must be aware this is a guiding technique requiring a lot of experience and a high degree of consideration. Second, if you pitch out 600ft of exposed 3rd and 4th class terrain all the time on a 2,000ft+ route, you are looking at a long day and possibly night out. This is not to say that there are not times to pitch out exposed 4th class terrain, but as one gains experience in this type of context, the ability to pick the safest and most efficient tool for the job will grow. This can only come with time and is not something that should be taken lightly. Use what you know even if it means missing dinner! Just avoid the knee-jerk reaction to judge someone else’s less conservative approach when you see them implementing it. They perhaps have a greater amount of experience and therefore can use a more liberal system with a greater margin of safety. Meaning that there simply cannot be hard and fast rules in such a dynamic activity. While we can live comfortably abiding by specifics in a given context (sport climbing, for example) they will not always transfer when we mix the bag and go try something as nebulous as alpine rock climbing. We must adapt and use the right tool for the job. Belaying is another element of climbing that often succumbs to rule based approaches rather than taking the task on with principles. Take the method Pull-Break-Under-Slide (PBUS) for example… I often see this taught as omnipotent dogma rather than, simply, a good tool to teach a novice with. If you see someone using a technique other than this while belaying, it is not necessarily wrong or risky. It may be that they need a different technique for the task they are tending to. As long as these three principles are adhered to, a belay system can be sufficient. First, we always keep our brake hands on the rope. Second, we only slide our hands when the rope is in the braking position. Finally, we must always position our hands according to our natural strength. A myriad of methods for moving rope through a belay system have been used over time with great success while meeting these principles. Someone’s seemingly foreign technique is not inherently wrong, assuming it matches the context and the tool while following these three principles. A proper body (hip) belay is perfectly suitable for belaying someone up a short section of 4th or low 5th class terrain. Likewise, the “hand over hand” method while top rope belaying a very fast moving climber is perfectly acceptable providing the hand transitions are done in the braking plane of the belay device being used. The user should also have conceptual knowledge of why they are using this technique over others. 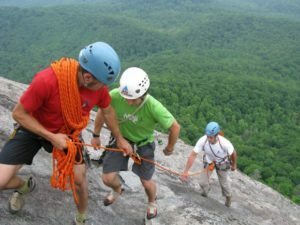 How to protect a pitch; when to use a backup or extension on a rappel; what kind of belay technique or device to use; when to lower vs. rappel a single pitch route; what rappel knot to use… these are questions we must ask ourselves and weigh on a spectrum. Our solutions must ebb and flow with the circumstance. I will likely protect a pitch more conservatively if it is wet, I am tired, in a bad mental state, etc than if conditions are ideal or optimal. Saying that a pitch must ALWAYS be protected THIS way or that THAT knot should NEVER be used is quite fallible at best and can be dangerous at worst. While individuals should and will likely be more conservative when starting out, we should empower those individuals and ourselves to question and experiment with new methods and knowledge providing it meets safe, fundamental principles and they are discussed through the filter of professionals. 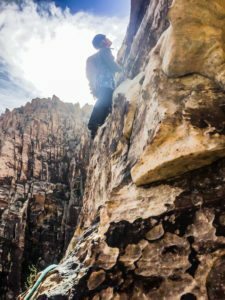 Ultimately, many of us feel that part of the allure of climbing is the freedom. We are responsible for our own decisions and must solve the kinesthetic math problem with the ultimate solution being safe and efficient success. You’re the boss of your own world, and that is truly rewarding. It then seems counterintuitive to shackle ourselves to steadfast rules when simply carrying principles with us to each new experience can open us up to greater rewards. Of course, none of this matters if we are not making safe decisions and going home healthy at the end of a climbing experience. When learning a new tool, it should be experimented with in a safe, inconsequential environment and discussed with a mountain professional before being implemented in the real world. Remember; ALWAYS be safe and have fun!